Review by AllTheBestFights.com: 2016-01-16, Deontay Wilder vs Artur Szpilka gets three stars only thanks to a good finish, the rest of the fight was quite boring. The undefeated Deontay Wilder entered this fight with a perfect boxing record of 35-0-0 (34 KOs=97%) and he is ranked as the No.4 heavyweight in the world (currently the #1 in this division is Tyson Fury). He fought three times last year winning the Wbc Hw title against Bermane Stiverne (=Stiverne vs Wilder) and defending it twice, with Eric Molina (=Wilder vs Molina) and against Johann Duhaupas (=Wilder vs Duhaupas). His opponent, Artur Szpilka, has a record of 20-1-0 (15 KOs=75%) and he entered as the No.19 in the same weight class. He suffered his only loss when he faced Bryant Jennings in 2014 (=Jennings vs Szpilka), since then he has won four fights beating Yasmany Consuegra in his last one (=Szpilka vs Consuegra). 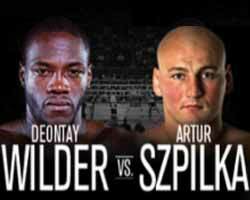 Wilder vs Szpilka is valid for the WBC World heavyweight title (Wilder’s third defense). Watch the video and rate this fight!